Rosacea is a fairly common skin disorder. Often beginning as flushing or blushing more than others in embarrassing situations, the skin disorder can become worse over time. If not treated in a timely manner, rosacea can cause excess redness that spreads to many areas of the skin. Here are a few basic facts about rosacea to help you understand what it is, and what you can do about it. 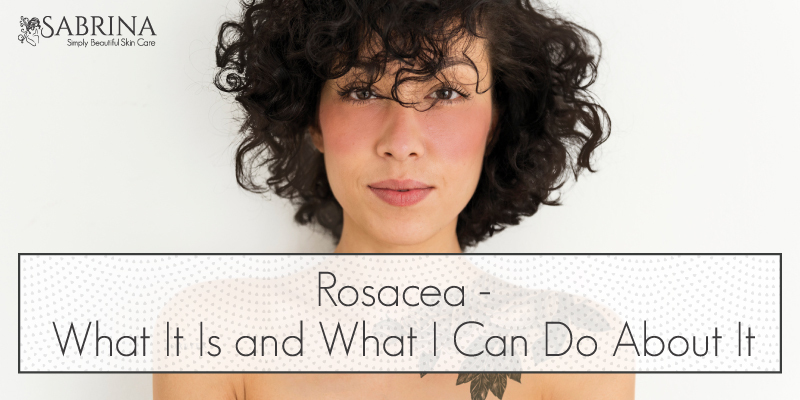 Affecting over 16 million Americans, rosacea is a skin disorder that involves a general red flush or small, red bumps appearing on various areas of the skin, such as the face, neck, and chest, but it is mostly found on the face, especially the nose and cheeks. A direct cause is still unknown, and a cure has not been discovered. Treating the condition can be a life long struggle. Rosacea is also much more common than you think. In fact, a number of celebrities are known to be rosacea sufferers, including Bill Clinton and the late Princess Diana. Rosacea can vary from person to person, and there are four subtypes of rosacea: erythematotelangiectatic (type one), papulopustular (type two), phymatous (type three), and ocular (type four). Type one is the most basic form of rosacea, which involves a general red appearance to the face, excess flushing, and visible blood vessels. Type two is a bit more severe, where the red flush is present along with small, acne-like bumps and swelling. Type three involves the thickening of the skin, also known as rhinophyma, as well as a bumpy texture. Type four is the most severe form of rosacea, which affects the eyes. The skin around your eyes can become red, irritated, and swollen, very similar to how a sty may appear. While a direct cause has yet to be discovered, there are a few things researchers have found to be potential causes of rosacea. Lifestyle choices like eating spicy food, smoking, and drinking alcohol are potential causes. Other causes may include the presence of the Helicobacter pylori intestinal bacteria, bacteria from skin mites, or cathelicidin bacteria. Rosacea is also linked to genetics. Those with Scandinavian or Celtic ancestors are more at risk for the condition. Rosacea can develop at various points in life, but especially between ages 30 and 50. People with pale skin or blue eyes are more likely to contract rosacea. There are a number of symptoms associated with rosacea, which can vary depending on the type of rosacea you have. The most common symptom across the board includes redness on the skin, especially the face, that doesn’t seem to disappear. Additional symptoms of rosacea may include red bumps that look like pimples, visible blood vessels, dry skin, general irritation, swelling, burning or itching. 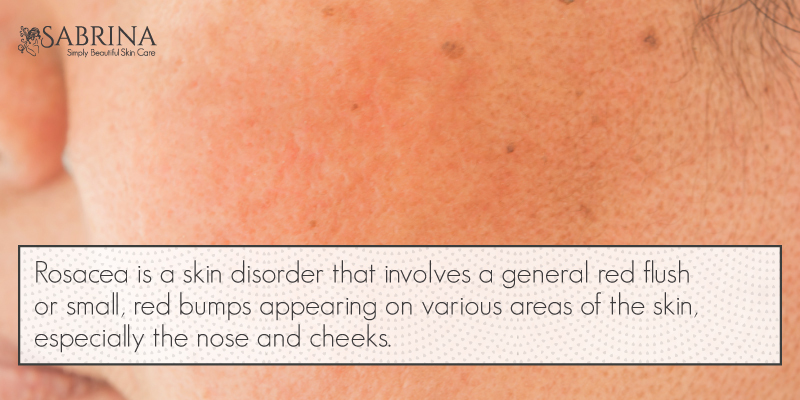 Other skin conditions may present with these same symptoms. Be sure to consult your dermatologist to get a proper diagnosis. Sometimes, what looks like rosacea may be something else or vice versa. Rosacea can be embarrassing and it can worsen over time if ignored. It’s important to find a treatment option that will soothe your skin and diminish your skin’s redness. First, consult your dermatologist for diagnosis. Different types of rosacea involve different treatments. Because everyone’s skin is different, your dermatologist may recommend something different than what your friends or family may use. Some typical treatment options may involve topical ointments, increasing your sun protection efforts, prescription medication, antibiotics, antibacterial cleansers, photodynamic therapy, glycolic chemical peels, laser therapy, pulsed light therapy, and more. 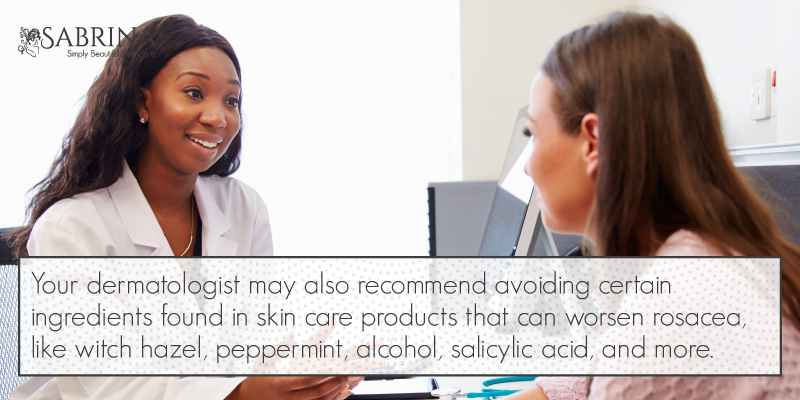 Your dermatologist may recommend avoiding certain ingredients found in skin care products that can worsen rosacea, like witch hazel, peppermint, alcohol, salicylic acid. If you are unsure of which products to switch to, consult your dermatologist for answers. When using skin care products, use organic formulas that soothe and heal the skin. SABRINA Collagen Rx Plus anti-aging face cream is an excellent choice for rosacea and sensitive skin. The green apple stem cells and marine collagen in this nutrient rich formula help to heal and balance the skin tone. In addition this excellent moisturizer also minimizes wrinkles and reduces pore size. Rosacea can reduce your self confidence and lower your self esteem, because the redness is visible on your face. To combat the appearance of redness try green-tinted cosmetics or primers. These can tone down the redness before you apply foundation and other makeup products. When it comes to sun protection, you may want to up your SPF game and use an SPF of 30 or higher to ensure your skin does not get irritated from the sun’s UV rays.